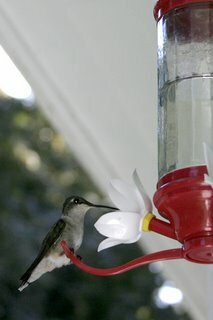 While writing my previous post I totally forgot that I had hummingbird food on the stove. We now have the sickly sweet smell of burnt sugar permeating our entire downstairs. And I just may have destroyed my small sauce pan!!! Very clever. The shot you put up looks good to me. How's Rocket doing? Is he any better?